Shares are available in a 2YO filly, by first season sire Stryker, which we purchased at the 2014 Magic Millians Vobis Gold sale. We have nicknamed the filly “Bellona” and we continue to be amazed by the professionalism which she has maintained ever since the day she was purchased. Stryker retained many of the excellent qualities from his sire, Fastnet Rock. But purchasing these qualities for a small fraction of Fastnet Rock’s stud fee is the biggest advantage. Flowing from the Danehill bloodline, it has come as no surprise that Fastnet Rock has gone on to become an impressive sire of stallions. Of his stallion sons other than Stryker, Fastnet Rock has produced Wanted, Foxwedge, Smart Missile and Hinchinbrook who have all had progeny hit the sales ring with very high demand. On the track, Stryker’s biggest wins came in the Group 3 BTC Classic over 1350m and Listed Heritage Stakes over 1200m. Beyond these wins, he was placed in the Group 1 Golden Rose, Group 1 Galaxy, Group 2 Challenge Stakes and Group 2 Pago Pago Stakes. Bellona is Spirit Of Sienna’s first foal but the damline is littered with success. Spirit Of Sienna is by the mare Classy Miss who has had seven foals make it to the track for five winners. Spirit Of Sienna’s damsire is Snippets which is a family that our stable has had outstanding success with. He produced a horse named Gunnamatta who we trained to win three consecutive Mornington Cups and more than $500,000 in prize money. This Danehill and Snippets cross has had exceptional success and we find it nestled beautifully in Bellona’s pedigree. The cross has produced Wanted (15 starts, $1,216,000 prize money) and Hinchinbrook (14 starts, $590,300 prize money) who now stand as stallions. Amongst horses still racing, the cross has also produced Scandiva (7 starts, $240,580 prize money, a close relation to Black Caviar), Jolie Bay (8 starts, 236,530 prize money) and Jazz Song (9 starts, $201,220 prize money). Those prize money figures are still climbing too! 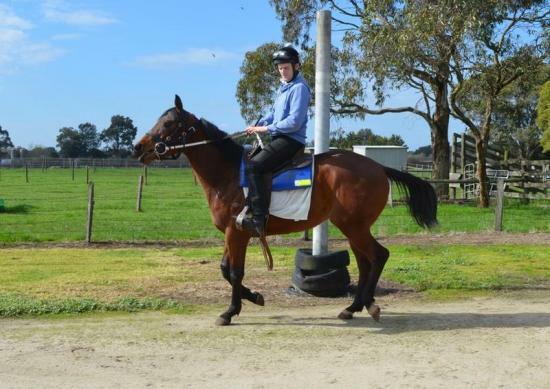 Bellona has a marvelous pedigree and is developing as a very promising filly. As a filly that is already nominated for Super Vobis and Vobis Gold, we were delighted with her purchase price. When we inspected her in June, we felt she was forward enough in her development to justify nomination for the 2014 Blue Diamond with her first preparation scheduled to commence in the spring of 2014.